The joy of school break is that I suddenly have all this “free” time that is usually consumed by school. By free time, of course, I mean snatches of 30 seconds where someone isn’t hungry or arguing over bike ownership or losing a Lego piece that is integral to their ongoing survival, so not really free in the way of being master of my own time, but free in the way of not sitting and reading and explaining and encouraging and teaching, and entertaining a preschooler at the same time. And if you’ve been around here longer than 30 seconds, it is no surprise that free time is craft time. In between all the sun-soaking and child-feeding and game-playing, I managed to actually get the quilt basted. Like an actual quilter who actually finishes the things she started. And then, brace yourselves…I STARTED QUILTING IT. I have decide to hand quilt this one, using nice chunky perle cotton in red, blue and green, to create a grid pattern. 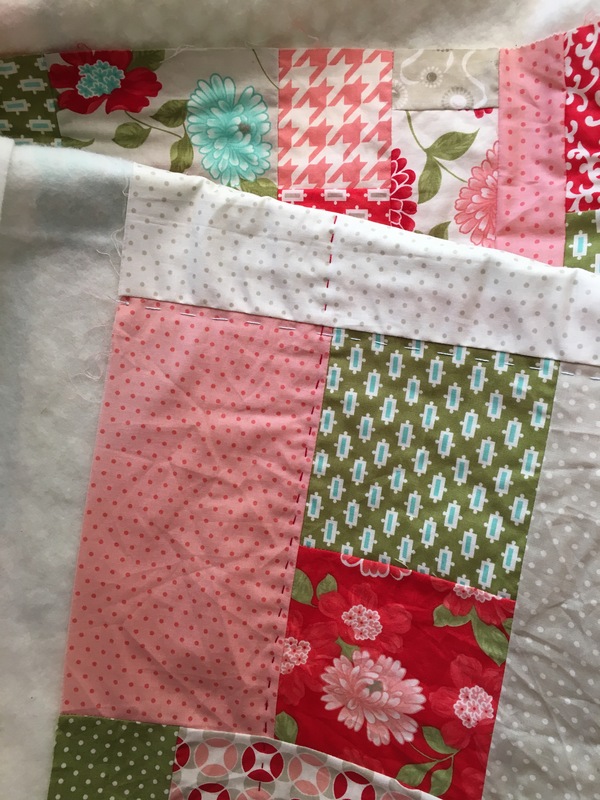 I feel like the gentle imperfection of the hand quilting will blend nicely with the mixy-uppy blocks of the improv. 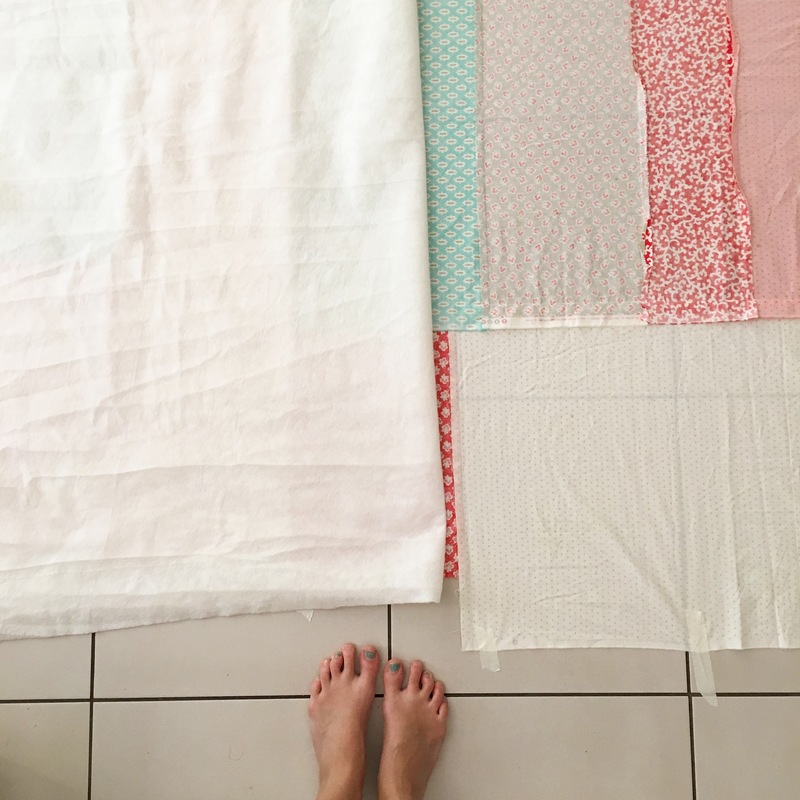 I’ve managed one vertical and one horizontal row, so it’snot the quickest project in the world, my I do love the effect of the hand quilting so far. Today, the craft marathon has continued. There has been crochet and cross-stitch and watercolour and a new canvas started, and not a great deal of otherwise productive housewifey type of stuff happening. I might even get another row of quilting done tonight as I finish off the last episode of Victoria (seriously, how good is it?). I’m hoping to keep up the daily posts until at least the end of the week so that I might go half way towards my Blogtober goal. Depends how much I get sucked into the craft marathon I guess! Happy hump day folks, I hope it’s been a creative one!